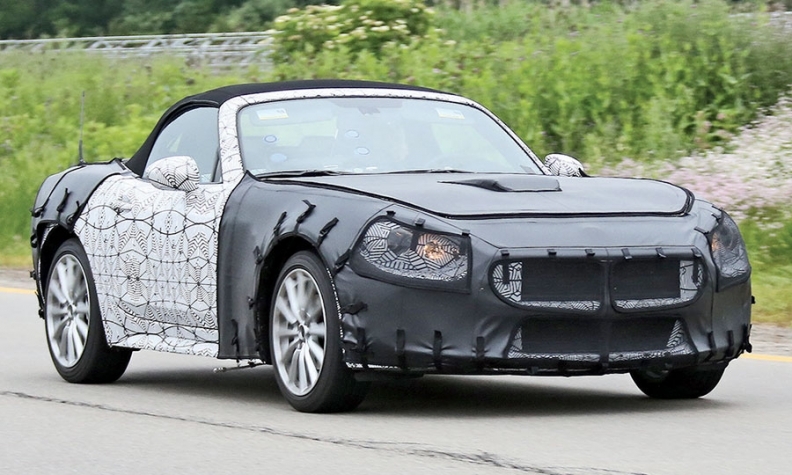 A spy photo gives a rare glimpse of the upcoming Fiat 124.
iat plans a high-performance version of the upcoming Fiat 124, Alfredo Altavilla, COO of Fiat Chrysler's Europe, Africa and Middle East region, told England's Auto Express in an interview. "You like performance? There will be an Abarth version," Altavilla said. There is no word on what engine would power the Abarth 124, though the leading contender would be the 237-hp, 1.7-liter turbo four used in the Alfa Romeo 4C, an engine that meets U.S. federal emissions standards. The 124 is based on the Mazda MX-5 Miata. Except for a few spy photos, the car has not been seen. Mazda is launching the 2016 Miata, which is new from the wheels up. Just one powertrain is available, a 2.0-liter four-cylinder rated at 155 hp. The Fiat and Mazda roadsters are not expected to share powertrains.